Monster Energy Yamaha Factory Racing Team’s Justin Barcia and Aaron Plessinger made the best of a difficult night at Oakland-Alameda County Coliseum to score valuable points at round four of the Monster Energy AMA Supercross Championship. With conditions tough for those that were on top form, the night proved challenging for Barcia, who was still not 100% fit after his big crash at Anaheim 2. In spite of the pain, the New Yorker finished fifth in his heat and went on to finish seventh in the main. Barcia’s perseverance keeps the 450SX title in sight as he trails the championship leader by nine points with 13 rounds remaining. His rookie teammate also had a rough night on the soft, rutty track. Plessinger struggled all day, but made some progress during qualifying and felt good going into the night program. The newly turned 23yr old had a good start in the main, something he had been working on all week, but unfortunately stalled out on the wall jump and his bike was damaged. Plessinger didn’t give up, pulling in a couple of times to straighten out his bike, and carried on to score points to remain within the top-10 of the standings. The Monster Energy Yamaha Factory Racing Team heads down south to San Diego, California, next Saturday, February 2, for round 5 of the Monster Energy AMA Supercross Championship at PETCO Park. 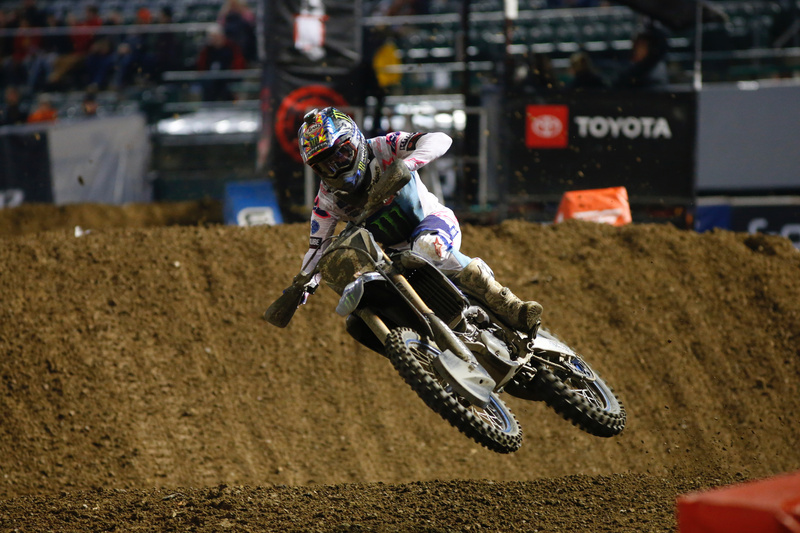 “Oakland was a tough night for the Factory Yamaha team. Justin Barcia came in not at a hundred percent after his massive crash last weekend at Anaheim 2. He showed up in Oakland in good spirits and gave it everything he had, but it was a struggle all day. He was very sore and a couple of sections just took it out of him. It was definitely an inspiration ride to finish where he did. He just needs some time to recover. “Wow. What a day. I had to be really mentally tough. I rode through a lot of pain, but made the best of it. Coming in I knew it would be difficult, but I was pretty optimistic about what I could handle. It was a crazy race for me. It was a difficult track, pretty rough, and I just had to push through the pain. “Oakland Supercross was a pretty tough one. I was kind of struggling all day. I felt good in the last practice even though the times didn’t really show. In the main, I got a good start but then stalled it on the wall jump. I had to jump off, then someone landed on my bike and bent it all up. I had to pull in twice to straighten it out.